After being dog lovers for many years, eventually our family fell in love with the puppy experience when our Golden Retriever Emma “accidentally” got pregnant with the neighbor’s dog in 2002. We learned (unexpectedly) that raising puppies was a beautiful, rewarding experience and we couldn’t get enough of it. 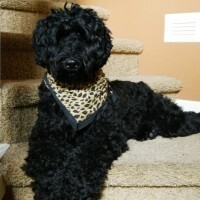 In 2010, we became an Oregon breeder of authentic Australian Labradoodles, one of the best breeds you can find. Our dogs are members of our family or live with loving, carefully selected guardian families; never in a kennel, and each dog and pup is loved individually. We breed only the best based on thorough testing of eyes, hips, elbows,coats, DNA genetic disease screening, and of course, temperaments. Pedigree examination is important for every dog in our breeding program. Healthy dogs with a great life span come out of incredibly healthy lines! Our dogs are raised in our home, receiving all the love, socialization and basics of family life living. You’ll find them stretched out on our sofa in typical Doodle style (on their backs) or hopping in the car to run errands with us. Every dog and puppy matters as one of God’s creation. Great care is what they deserve. Some of the most important work with do here with the puppies is the bio-sensor program, “emotional conditioning,” and crate training to help them transition more easily into their forever homes. This is all super important. Read on to learn more. As an accredited breeder and member of the Australian Labradoodle Association of America, I pledge to the ALAA that . . .